We are disappointed to hear that your most recent experience has not been a positive one. We will be following up with you soon to learn more. We seen the add for the 50% 50% deal guarantee installation before Thanksgiving. I had a sales rep come to my home it was either Wednesday or Tuesday of last week. We set a date for carpet to be installed in my living room and hallway for 11/116/16 I couldn't stress enough to him I needed this to be done for sure on this date'" I was guaranteed it would be with no problems." He told me I needed to make sure everything was moved out of the area for when they came. So I had to pay for my furniture to be moved into other areas of my home because my husband and I were unable to move it ourselves . I'm on chemo twice a day because of a chronic illness. We also have other furniture being delivered on the 11/17/16 that we had purchased so everything would line up accordingly with the installation of the carpet. We have family flying in from Boston for Thanksgiving. 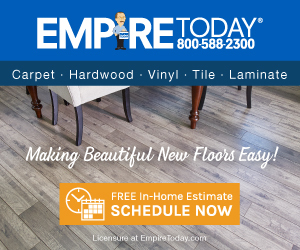 Between last week till now Ive been having phone calls comping in from Empire to confirm the scheduled appointment , at 2;00pm today 11/15/16 I received a phone call from Empire telling me that they have to reschedule they won't be able to install the carpet until the 11/29/16. Now I'm stressed out which is the worst thing for me being on chemo with my illness, because they called me late afternoon the day before the carpet was to be installed I explained to them I needed this to be done as promised , I have my kitchen and dinning area filled with furniture from the movers I had to pay to move my furniture out of the area for them to install the carpet, I have my other furniture being delivered and there wasn't enough time giving to me to cancel and with them also I have no place to set up for Thanksgiving now because of my furniture having to be put into the kitchen and dinning area. After explaining all this to Empire they didn't even care , I demanded to speak with a supervisor to get this issue resolved ..I was informed he was on another line the supervisor name was Paul in head of the installation Dept, he would call me as soon as he got off the phone." I never received a call back from him." I then called the 800# spoke with a supervisor rep she said she was going to talk with another supervisor and promised to call me back by 4;00pm thats when she leaves' "I never received a call back. By this time I'm really stressed, upset , now with being on chemo I became sick. I didn't like: Canceled appt 3 times at the last minute. Review #955831 is a subjective opinion of User955831.